One writer wonders if beer is losing its democratic appeal. A man walks into a bar and says, “Give me a beer.” The bartender pours him a beer. The man drinks it. Funny, right? Because that would never happen. The other day I went with some colleagues to an alleged “corner tap.” Inquiring about beer, we were presented with heavy binders of the kind once brandished exclusively by sommeliers. Beers whose names seemed to have been chosen via random stabs at a dictionary (Snake Dog, Surly Furious, Clown Shoes) were given long and inscrutable annotations, fortified by such essential data as ounces per serving and alcohol by volume. Then began a back-and-forth with our waitress, and samplings, and send-backs, accompanied by a chorus of knowledgeable opinions. By the time everyone was happy with their order, we’d forgotten what it was we’d come to talk about. Has the craft-beer revolution gone too far? Its beverages are delicious, but its culture can be oppressive. And its most outspoken creators, servers and consumers have become a new generation’s record-store clerks: If a record-store clerk is someone who knows everything about music except how to dance to it, then the craft-beer connoisseur is someone who knows so much about beer that he’s the last person in the world you’d want to drink it with. 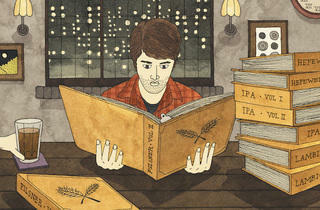 Growing up in Montana, my friends and I judged beer on three criteria: price, coldness and quantity. Sure, we had our aesthetic preferences—the deer and trout on cans of Schmidt were more festive than the granary-chic motif of Schaefer—but beer was a means to an end, an inhibition-loosener that allowed us to believe we were acting like adults and, hopefully, to get laid. When I moved to Chicago in my twenties (I’m now 42), I began enjoying Guinness, the gateway beer. From stout I moved to ale and porter, to maibock and Oktoberfest, to bitters, hefeweizen, lambic, rauchbier, barleywine and even the odd pint of lager. I enjoyed learning about beer. I enjoyed drinking it. But I had a nagging feeling we were all talking about it too much. Once, new arrivals at parties were greeted with directions to the keg. Now they are held hostage in the kitchen while the host catalogues the contents of his refrigerator: “Let me see…I’ve got a growler of organic kölsch, a six-pack of triple-hopped IPA, a limited-edition Trappist ale that’s been waiting for a special occasion.…” Is this a special occasion? The dumbstruck guest hardly dares to hope. Meanwhile his mouth grows drier and drier. 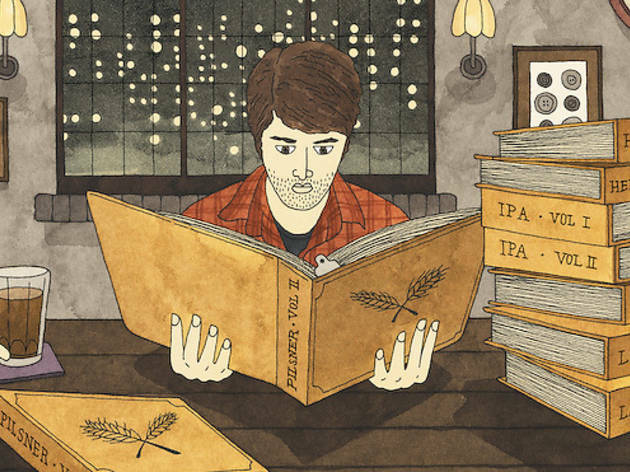 Beer, like food, should provide an occasion for conversation, not the conversation itself. Saying “the proper serving temperature is actually 12 degrees Celsius” does not qualify as repartee. Flirting with professional disaster by gossiping about coworkers with coworkers, however? That’s entertainment at its finest. But the social arts are under attack by brewers, enthusiasts and cicerones (a word, let’s admit, most of us learned only a minute ago) who see beer as a vehicle for demonstrating in excruciating detail their knowledge of zymurgy, from top fermenting to bottom fermenting. The harder the beer menu becomes to decipher, the more we rely on these bearded demagogues, and the sooner our drinking democracy becomes a heavily hopped oligarchy. The moment anyone feels confused and embarrassed when ordering a drink, the battle has been lost—and by that measure, it’s already too late. Beer doesn’t have to be fussy, elitist and overcomplicated. That’s what wine is for. Beer should be for the rest of us: affordable, easy to enjoy, thirst slaking and confidence restoring. Don’t get me wrong: I love beer the same way I love records, and I even have a bemused place in my heart for overbearing know-it-alls. But if they keep ruining my fun with beer, I’m going to have to find another drink. And with the lowbrow joys of moonshine already being celebrated by whiskey snobs, the only choices left may be tea or coffee. I hear those are pretty straightforward.